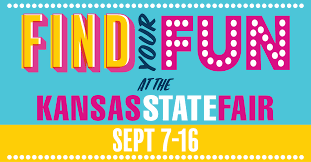 The Kansas State Fair begins THIS WEEK! Some of you may not know, but there is a theme each day of the fair. On Friday, September 14th, Ag Innovation Day was created specifically for farmers and ranchers. There will be Producer Power Chats: twelve 20-minute, fast-hitting talks on topics like beef traceability, irrigation innovation, and the newest combine in the nation. Talks are from 10-11am, 12-1:30pm, and 2:30-6pm at the House of Capper directly east of the administration building. Innovation Row: One-day (all day) display of cutting-edge equipment, including the Tribine Harvester, located by Gottschalk Park. Commercial Exhibits: Meet with dealers and manufacturers of a wide range of equipment, utility vehicles, supplies, and tools. K-State Research & Extension Activities – Pride of Kansas Building: Talk to an expert about livestock production. 4-H and FFA members get $5 off concert tickets with promo code 4HFFA.